Come to the DISNEY’S D23 EXPO. on Aug.19-21 of 2011, at the Anaheim Convention Center in Anaheim Calif. It is where Disney fans of all ages can come and celebrate the 25 years of movie magic on the projects from Disney, Pixar Animation Studios, and Marvel Studios. See a never-seen-before presentation with an all-star appearances by Jason Segel, Kermit the Frog and Miss Piggy, Willem Defoe, Jennifer Garner, Sara Silverman, the cast members from Marvel’s THE AVENGERS, and other surprise guests. There will be five sessions that are devoted to the artisty and technical wizardly of Pixar with the characters of Monsters University with director Dan Scanlon and production designer Ricky Nierva, An conversation with the Pixar creative team, Michael Giacchino’s music of Pixar, and The Art of the brave is with the production designer Steve Pilcher and the shading art director Tia Kratter. Fans can also explore the world of Walt Disney Studios with sneak Peeks of the upcoming films that are in high-definition Blu-ray 3D. And get a close-up look at THE PIRATES OF THE CARIBBEAN film props, set pieces, and costumes. There will also be art exhibits, book signings, drawing classes, demonstrations, and a meet-n-greet. 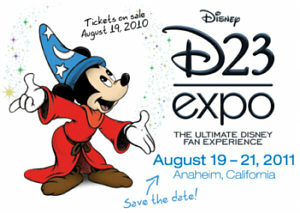 Tickets to the D23 Expo are available at http://www.D23Expo.com. For the latest D23 news and events fan can follow Disney on Twitter, YouTube, and Facebook at DisneyD23. Disney fans can also join D23 at www.Disney.com/23. Comments for DISNEY’S D23 EXPO-AUG.19-21 OF 2011 are now closed.